Really, it's December ALREADY??! Hope everyone had a good Thanksgiving, and now on to the next food holiday! I recently received a Batch box to try; these are gift boxes of locally curated foods available from a couple southern US cities, and now Austin. For $29.99/month, you can give a box subscription to your favorite foodie! (Or yourself!) 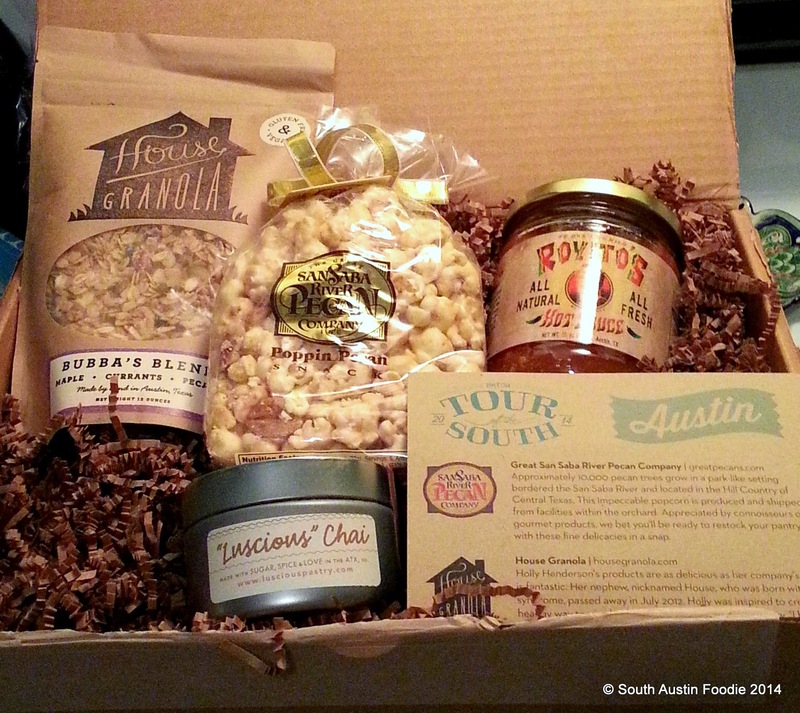 My box had House Granola, Great San Saba River Pecan Company Praline Popcorn, Royito's Salsa, and Luscious Pastry Chai Tea. Disclaimer: I received the box for free; opinions are my own. And hey, it's a pretty neat and very convenient idea, so check them out! Batch boxes are also available from Nashville, Charleston, and Memphis. 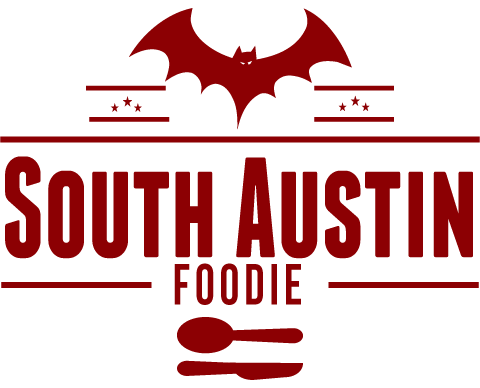 -- Odd Duck is throwing a trailer throwback party, Tuesday, December 9th, 5 pm onward; suggested minimum donation is $25, and proceeds go towards Zilker Elementary's Edible Schoolyard program. -- Homeslice's Pizza's Carnival o' Pizza was rescheduled to December 13th. -- Also on the 13th, drive-thru burger chain P. Terry's will donate all of their day's profits from all 9 of their locations to the Austin American-Statesman's annual Season of Caring campaign; last year P. Terry's donated over $21,000 to this cause. Eat a burger on Saturday! -- Texas Land and Cattle is offering holiday drink specials as well as some limited time menu offerings, Crab and Shrimp Stuffed Mushrooms and a smoked meat board for two people with sirloin, quail, and pork offerings. -- Celebrate Christmas Eve Italian style with Sagra's Feast of the Seven Fishes, December 22-24, $39.99/person, reservations required and space is limited; additional $25 for suggested wine pairings. Dishes include salt cod, squid ink pasta, shrimp and mussel stew; full menu is here. -- The next round of Indie Chefs Week will be January 6-10; tickets begin at $195, and dinners will be held at Foreign and Domestic, the "home" of the event's founder, Ned Elliot. The event gives up and coming chefs from across the country to showcase their talents in a pop-up restaurant setting. -- Delysia Chocolatier won gold at the recent International Chocolate Salon Awards, for their carrot cake truffles in the "Most Unique" category, and white peach balsamic truffle in the "Top Truffle Artistry" category. Delysia's new Chocolate Culinary Center is at 2000 Windy Terrace in Cedar Park. -- Fresa's will be offering tamales through December, created by Chef Rene Ortiz; varieties include chicken adobado, queso Oaxaca, and hoja santa, and run 3 for $7. 6 for $13 and 12 for $24. 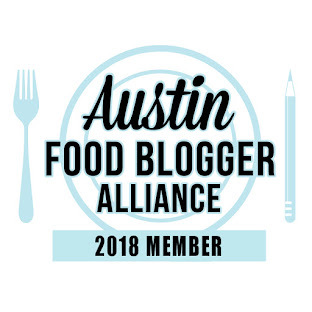 -- Austin Monthly magazine's new food critique is Jolène M. Bouchon, who has previously served as the deputy digital editor for Martha Stewart's Everyday Food magazine. -- The Statesman came out with a great listing of area gluten free restaurants/dishes. Keep this list handy! -- Peached Tortilla just opened at 5520 Burnet Road. -- Juniper, a northern-Italian restaurant will open at 2400 E. Cesar Chavez in the spring. -- Spun Ice Cream is coming to 1912 E. 7th Street with liquid nitrogen-made treats. -- A-OK Chinese at 1509 South Lamar... I was sad to see this one go, as I felt they never really hit their stride. On the flip side, Mexican/Korean fusion food trailer Chi'lantro will be taking over the spot in their first foray into the land of brick and mortar.